Our tour bus drove right up to the enclosed entrance as the lite sign shone bright in the dark exterior, brandishing the name of SC BRAGA. 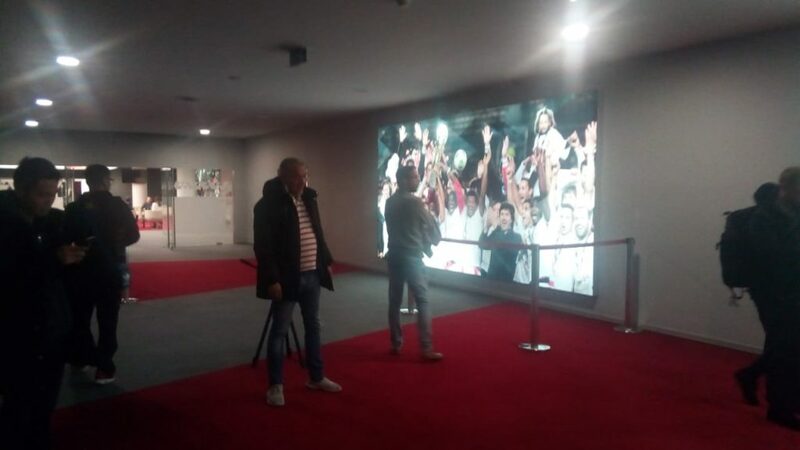 Walking through their hollowed hallways exhibited decades of history in the form of hundreds of trophies, cups, souvenirs and photographs in the museum. The 3,000-seater stadium, etched from the hard rocks of its granite-scarred mountainside, took 3 years to construct with the first 18 months blasting out the base to erect a not to be forgotten bastion of champions. Rocks, like the rain water, were collected, stored and recycled to create a modern day structure with breathe-taking views from inside and out. Homester boxes or visitors stands on opposite sides are held together by multiple cables supporting both expansive roofs, grounded on the bedrock of the ages, while a massive 30 x 9 metre video board overlooks the scenic venue. 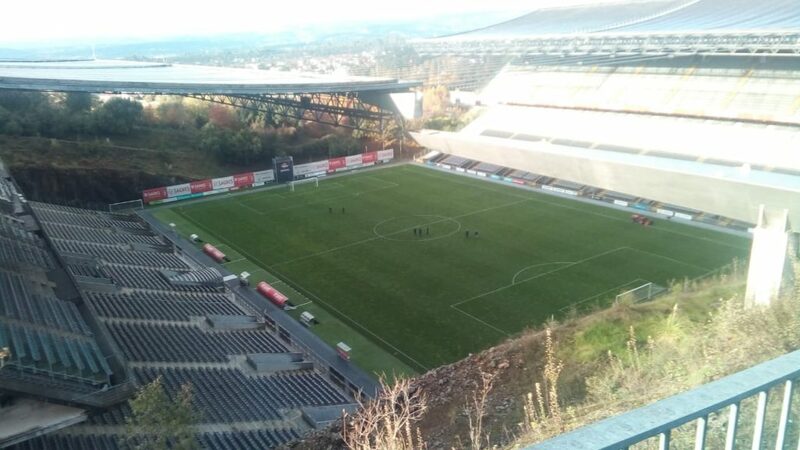 The one-hour tour was exhausting from climbing up 50 metres, walking the car parks, crossing the hillside to both stands and seeing changing rooms, concessions and boxes. 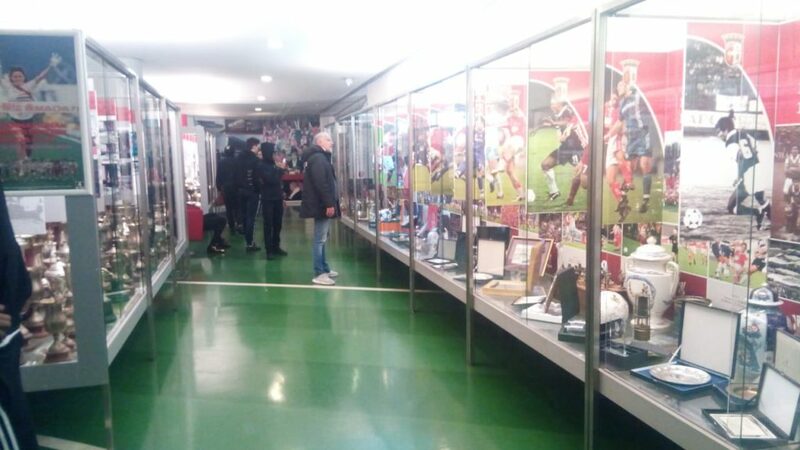 Of course a media centre and gift shop to purchase memorabilia are preesent. Our gracious hosts bid us goodbye as the 9 attending groundsmen manicured the immaculate natural grass field; this is quickly become a rarity in developed football nations. Lunch was followed by a bit of traveling for over an hour, then a 4:30pm friendly game including a Division 1 Club with a seating capacity of about 2,000 persons. Coach Tanou was at the helm today and has a different philosophy to operate; it works. Team coordination, confidence, and communication unfold to match the counterparts as the visitors finished on target, regularly hitting the goal frame twice in flowing moves not witnessed before. 5 second half substitutions added even more control. Pressure built and exploded as a steal, coupled with 4 passes among Cameron, Ramsay, Magee who sets up the slick forward, Alec. He rounded the advancing goalkeeper to slot home, 1-0 in the 82nd minute. Lank Academy exhales, with great joy finally as spirits lifted. At dinner, a moment is grasped to celebrate midfielder, Charles Tate’s, 17th birthday with a small piece of cake hoisting a candle as the boys and adults tried their best to harmonize around the Happy Birthday Song. Charles was pleasantly surprised, so too the entire squad, as thank yous and goodbyes are said before some head home to Jamaica later today, tomorrow and Sunday.